Why Have My Toenails Turned Yellow? You have dark yellow toenails, and it is highly ‘likely’ to be due to toenail fungus (tinea unguium). However, other ‘potential’ causes must be ruled out before commencing a treatment plan. We’re going to look at each reason for yellowing nails so that you can make an accurate self-diagnosis and determine if you should speak to a doctor. Our feet are by far the hardest-working part of our body. We try our best to look after our bodies, from head to toe. But are we successful? Hard yellowing toenails can be a symptom of an underlying health problem. If you don’t fix the medical condition that’s affecting your toenails, it’s likely that the problem (as well as your health) will gradually worsen over time. The objective of this in-depth guide is to help you to understand each of the causes of discoloration. We’ll then explain how to treat yellowing toenails, as well as some of the best ways to prevent it from happening. With that said, let’s get started. 1 What Causes Toenails to Thicken and Turn Yellow? 5.1 What Are the Exterior Causes? 5.2 What Are the Interior Causes? What Causes Toenails to Thicken and Turn Yellow? Healthy nails are usually clear in color and don’t display any noticeable issues, such as cracks, vertical lines, distortion, and bumps. Nails protect the tips of your toes from damage. They also act as a visual indicator of the overall health of the individual. We ignore nails at our peril. Having white nails can sometimes be a sign of cirrhosis of the liver, congestive heart failure, or diabetes mellitus. Rippled nails are a classic sign of psoriasis. They can be an indication of atopic dermatitis, irritant dermatitis, or allergic dermatitis. Nails can also thicken and turn yellow due to the condition. Seniors often have yellow, thick nails. As we age, our nails naturally develop these qualities. However, they can also be a sign of ill health. Depending on your lifestyle, any number of factors can potentially lead to malformed toenails. Dermatophytes are pathogenic fungi that grow on skin, hair, nails, and other body surfaces. Keratin, found in skin and nails, are what dermatophytes feed on. Athlete’s Foot is perhaps the most well-known example of bodily funguses. Onychomycosis, also referred to as tinea unguium, is an infection that is primarily confined to your nails. It is the same fungi that cause Athlete’s Foot, Ringworm, and Jock Itch. It occurs because of contact with those previously infected or otherwise coming into contact with the fungus. It thrives in warm, moist environments, which is why it so often appears on your feet. Toenails are more affected than fingernails because they are confined to your socks and shoes. While our hands are washed regularly throughout the day, our feet and toes are only cleaned once a day, if not less frequently. This provides optimal conditions for the propagation of onychomycosis. A fungal infection may affect part of one nail, a whole nail, or every nail. To avoid any further spreading and development of the fungus, it is imperative to recognize when your nails are becoming unhealthy. Some people are far more likely to experience fungal infections than others. If you suffer from medical conditions such as diabetes or autoimmune disorders, you will be at a much higher risk. You are more likely to experience a yellowing and thickening of the toenails if you have one of these illnesses or diseases. Small dark spots under the toenail(s) indicate the beginning of an infection. These occur when onychomycosis first infects the person’s body. They enter through cracks in the nail, underneath the nail, or in the corners of the nail. The infection begins when the fungus takes root in the nail bed. This is when it is easiest to treat it. Many people view it as an aesthetic issue, but that’s not the case. They are unaware that there is an infection, so it gradually worsens. Most people leave it alone, assuming it will go away eventually. Though it may not affect the whole nail initially, if left untreated, it can spread from the big toenail (or pinky toenail) to each of your nails. Yellowing tips are yet another early indicator of onychomycosis. It is a sign of the most common fungal infection, ‘distal subungual onychomycosis,’ which accounts for up to 90% of cases. Underneath the toenail is the easiest place for the fungus to take hold. The nail that once protected your toe is now a means of protection for the fungus. It is common for those first small yellow dots to take hold here first. The tips of nails are perfect biomes for the fungus for two reasons. They are often overlooked when it comes to cleaning. Your toenails might only be checked when they’re cut once per month. For most people, lint and fluff can accumulate under the nail over time. The same is true of fungus if left alone. They are ideally located to contaminate the rest of the toes. It may begin as an isolated issue, but it can be cultivated easily because of the location of the infection. The toes, as stated previously, are hemmed into stuffy socks and shoes for many hours at a time. As your feet sweat, they become a perfectly moist and warm breeding ground for the fungus. If the infection is not treated at this stage, the rest of the nail, if not all ten nails, will quickly follow! This is the culmination of all the earlier symptoms. The gradual yellowing of the nails is a clear, but misunderstood sign of infection. If a nail is entirely yellow or otherwise discolored, then it has become entirely infected. The yellowing can be the result of several factors, both preventable (your actions) and uncontrollable (medical conditions). Therefore, it is essential to check with a doctor if you are unsure of the exact cause. The underlying cause may need to be medically treated. Thickened toenails occur as onychomycosis develops. They are the result of nail cells (called onychocytes) reproducing faster than the nail can grow. At this point, it can be difficult to ignore the visible symptoms. The nail may start to push into the toe itself, making it extremely painful. This distress only compounds when wearing footwear or applying pressure to the infected area. By this point, the small dots will have grown bigger. This is the fungus growing and spreading. Alternatively, your nails can thicken due to old age, or due to another exterior factor. Trauma or injury to the nail often causes it/them to thicken. In this case, thickening of the toenail is a response to an injury and not due to a fungal infection. However, if the nail displays any of the previous symptoms as well, then it’s most likely infected. Injury can also give fungus an easy point of entry into your toenail(s). Yellow toenails won’t grow out, no matter how long you wait for it to happen. A rotting toenail is the terminal stage of infection. By this point, the nail itself is decaying, and can no longer be medically treated. Removal of the toenail is the only course of action left. The nail can become detached from the base and fall off on its own. Alternatively, the nail can begin to rot in place. Even if the nail is removed, the fungus can continue to spread as it continues to live in the nailbed. Initially, it will infect the skin surrounding the infected nail and will likely spread to other nails if not attended to quickly. A rotting toenail is identifiable by its complete discoloration, disconnection from the toe, and brittleness. The more rotten the nail, the easier it will break apart. The big toenail is most likely to be affected. It may appear to be shrinking, or misshapen. This is due to the fungus superseding the confines of the nail and warping or decaying it as a result. For this reason, a rotting nail will look ugly, thick, yellowed, flaky, and lifted. If it has reached this stage, it is recommended that you seek medical attention. It will need to be surgically removed, and any remaining fungus will need to be treated so that a new toenail can grow in place gradually. Other symptoms to note throughout its progression include a bad smell, yellowing cuticles, sore skin, pain, and swelling. It is not always enough to apply a gel because the infection is embedded deep under the nail, and it’s difficult to reach. That is why you may need a complete system that’s proven to work. Well, that’s what you get with this system, as there are three treatments in one all-inclusive kit. When combined, they provide the best yellow toenail fungus cure. The ingredients are all natural, so you’ll enjoy the benefits of tea tree oil. This natural oil has long been used as a topical treatment for toenail fungus. It treats the cause of the infection, soothing any discomfort and restoring the original healthy appearance of the nail. Feedback from previous users has been extremely favorable. The majority of Amazon customers awarded it top marks. Use this proven formula to start getting the fastest possible results. Find out the latest price for the Purely Northwest Toenail Fungus System on Amazon! One overlooked aspect of fungus under the toenails is a substance called keratin, which is often responsible for a fungus returning. The last thing that you want is to get rid of the infection only for it to return a few months later. This doctor-recommended nail gel is designed to eliminate 99% of all keratin, which makes it the perfect choice for killing fungus and keeping it away for good. You’ll get a generous-sized bottle of the formula. You can expect it to last, so it represents exceptional value for money. Store it away in your cupboard after you’re cured as a precautionary measure. This 100% natural treatment is easy to apply and highly effective. The sooner that you take action, the faster that you’ll clear up this condition. The fungus will NOT go away on its own, so take action now to fix yellow toenails at home. Find out the latest price for Xenna NonyX Nail Gel on Amazon! When you have nail fungus, you want the discoloration, thickening, crumbling and bad smell to be gone fast. You need a product that is proven to work and is entirely safe to use. This treatment works to kill the fungus. When your yellow nails heal, and you modify your foot-cleansing routine, the fungus won’t come back. It also works to whiten the toenail after the fungus has cleared up. This is important because many times a new nail will also grow back that’s yellowish in color. 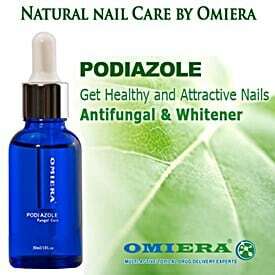 Podiazole is approved by doctors and podiatrists. It can be used instead of a toenail fungus medication, such as Sporanox or Lamisil. It has no chemicals in it what-so-ever, so it’s suitable for just about everyone. It’s a proven yellow toenails treatment that will restore the health of your nails. Unlike many other products, you can still use antifungal nail polish, with no negative impact on how this product works. Omiera Labs has been a trusted name for many years. This product has a high success rate, and this is backed up by real customer reviews. You can’t go wrong with this excellent at-home treatment. Find the best price for Omiera Labs Nail Fungus Treatment on Amazon! You’ll start to notice the initial signs of recovery if the infection is treated when the symptoms are still mild. You should never delay treatment when you see a black spot or some initial yellowing of the nail. If you catch it sufficiently early, you’ll be able to get healthy-looking toenails within weeks. If the cost isn’t your primary concern, you could get laser treatment. It works well, but don’t be surprised if you face a bill of $1000+. It isn’t an overnight cure, and the number of treatments that are needed will vary based on the severity of the condition. Insurance companies won’t cover the cost because it isn’t considered a medical issue. Perhaps surprisingly, they find it to be only a cosmetic issue. If you want a treatment option that you can use at home, find out about the NCure laser device. They’re easy to use and require only a series of 7-minute sessions. 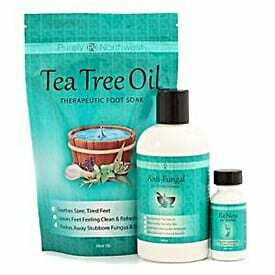 Look for soaks that utilize ingredients, such as tea tree oil or another essential oil for toenail fungus, because it will stop the fungus from spreading. You can also combine it with an Epsom salt or another type of exfoliating salt. This removes the dead layers of nail, so that other formulas can get straight to work. When your feet have been in hot, sweaty shoes, the fungus can grow. When you use a foot soak, you will be getting rid of toenail fungus and giving your feet a chance to rejuvenate. You’ll then have the rest of the night to let the fungal treatment do its job. To get faster results, make sure that you trim your nails as short as you can. This will allow the soak to get into the nail bed, under the nail, where the fungi are growing. The sooner you kill it, the faster it will work to heal your inflamed skin and flaky nail. You’ll find that Rocky Mountain Therapeutic Foot Soak works well. It is made with Epsom and mineral salts, as well as essential oils. Make the experience more pleasurable with an electric foot spa. For an anti-fungal cream to work, you have to make sure that your nails are trimmed. You must rub the cream into your nail and skin, as close as you can to the nailbed. This can be tricky because you can’t physically lift your nail without causing pain and further harm. Creams work by soaking into the nail, to get deep down to the nailbed, where the fungus is hidden. The cream will help to shed the dead nail cells. Be careful when filing down your nail. You should only do it a little at a time, as you can hurt it, or even cause it to break. Some creams do work particularly well for treating a fungal toenail infection. There are anti-fungal polishes that hide AND treat fungus. If your nail is thick and crumbly, it will show through the polish, no matter how many layers you put on. Some people choose to cover up fungus with a fake nail. While this is a temporary ‘fix’ for the aesthetic problem, it’s likely to make the problem worse. Non-medicated polishes can cause keratin granulation. Antifungal polishes help to keep fungus away, but they are not the best toenail treatment. They’re just a better option than using regular polishes or acrylic nails if you want to have nice-looking toenails. There is a prescription toenail polish, containing ciclopirox, that is available from your doctor. It’s like a treated lacquer, instead of polish, though. It’s not going to disguise the condition. The best anti-fungal socks are made to wick away the moisture from your feet. This will allow your treatment to work faster, and will also help it, as the socks will prevent any further growth of the fungi. The fibers are infused with copper, which stops the fungus from getting any worse. Copper is naturally antibacterial and antifungal, killing 99.9% of the bacteria and fungus on your feet after only 12 hours. Many people are turning to natural products because they don’t want to avoid an adverse reaction. Some have enjoyed good results with apple cider vinegar. The vinegar is acidic, and no type of fungus can live in acidic conditions. The most common way to use this formula is as a foot soak, using it for about 20 minutes a day, twice a day. Others claim to have enjoyed success using Vicks VapoRub for toenail fungus. Research by the Journal of the American Board of Family Medicine found that people who used Vicks to treat fungus enjoyed positive results, but the sample was relatively small. Most essential oils have been around for centuries, but have only recently been introduced as one of the ingredients for OTC treatments. These oils have healing properties, and tea tree oil is excellent for treating Onychomycosis. Coconut oil is good, as are argan oil and oregano oil. They all have antifungal and anti-bacterial properties, as well as anti-inflammatory and antiseptic qualities. Other popular remedies include Listerine and cornmeal for toenail fungus. As they work, you’ll hopefully notice that pain and inflammation will diminish. There are prescription medications available, but they do have side effects. These include gastrointestinal disorders, headaches, losing your sense of taste, diarrhea, and rashes. Griseofulvin can be given to children, but none of these medicines can be safely given to pregnant women as they can affect the fetus. It’s likely that your doctor will advise you to use the best over-the-counter toenail fungus treatment as it’s safer. The problem with prescription meds is that they not only attack the fungus, but they can cause liver damage and heart problems. If your fungus is horrible, they may give you medication, but your progress will be closely monitored by a medical professional. They have about a 75% success rate, but the condition often returns. This could be because of your health or failure to modify how you care for your feet. Healthy feet depend on good hygiene, and this is reliant on healthy habits. Particular attention must be given to the feet and toes in this case. Keep your feet free from infection with clean socks that have antifungal properties. Our feet sweat a lot over the course of the day, which our socks usually soak up. Training socks are thicker for this exact reason. If you wear dirty socks, then you expose your feet, toes, and nails to a bacterial and fungal paradise. Without being cleaned, your socks will not soak up as much sweat, leaving your feet damp. Your feet end up festering in a warm, moist environment: perfect for growing fungus. Clean socks mean your feet won’t suffer unnecessarily. Shoes that are too tight can cause long-term foot problems, not least issues with your nails. If the nails have no space to grow, they may become ingrown instead. This heightens the risk of infection considerably and may cause severe damage. Clean shoes facilitate the same positive environment that clean socks do. A dirty shoe interior should be avoided if you wish to promote healthy feet and nails. You can remove fungus from your shoes with the StinkBOSS shoe deodorizer. Perspiration can be reduced by wearing breathable footwear. This allows more air to circulate and cool down the foot. Excessively sweaty feet may benefit from shoes made of a mesh fabric, for maximum airflow. If your shoes are overly tight, you can create extra space with a shoe stretcher device or shoe-stretching liquid spray. This will prevent trauma and allow your feet/nails to breathe more easily. After showering, especially in public places, it can be easy to forget to dry your feet. This can be dangerous as fungal infections are commonly spread in communal showers, changing rooms, and gyms. By drying your feet thoroughly and applying an antifungal powder, you can make sure that any bacteria will be deprived of a wet, moist area to reproduce it. Use this opportunity to examine your feet for problems. As you’re drying off your feet, you can check for any scaling or yellowing around the toes and nails. If you are aware of what to look for, it becomes much easier to identify when a problem occurs. As we have touched upon previously, toenails can turn yellow for other reasons. Some will be the result of activity, others the by-product of bodily processes. It can also be genetic, or, most commonly, the result of old age (or the aging process). In contrast to onychomycosis, which is an infection, yellow toenails can also be the product of our own actions. Generic over-the-counter nail polish, for example, can react with keratin in the nail, resulting in a yellowed coloration. Poor circulation, on the other hand, means that you are more likely to contract medical conditions that affect the feet and toenails. If a nail begins to turn yellow, it is essential to find out the reason. Identifying the correct cause of the yellowed nail will result in the right treatment being selected. What Are the Exterior Causes? Running for too long in ill-fitting shoes can cause damage. It is usually the after-effect of ‘subungual hematoma,’ or black toenail. This is the term for pools of blood forming beneath the nail after extended, repeated runs in poorly-fitting footwear. The nail and the flesh beneath the nail become damaged as a result. It usually clears up quickly, but not always. If the damage occurs frequently, it can lead to more severe toenail problems. 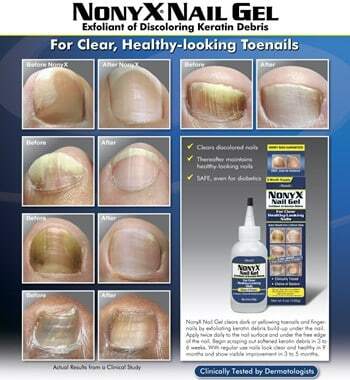 Onychauxis, the overproduction of keratin, can result in black toenails. Unlike a fungal infection, the issue is mostly aesthetic. Filing down or clipping the overly-thick nail is the easiest solution. Preventing repeated damage to the nail through a series of modifications is also recommended. Nail polish has chemicals, such as formaldehyde, that can have an adverse reaction to nails. Darker nail polishes are more often the culprit as the coloring is more concentrated. However, it may not consistently be the result of darker nail polishes, as it is the ingredients, rather than the tone, that causes the reaction. A color reaction may take several weeks to appear. Not everybody will be affected in this way by nail polish, and for this reason, it can be hard to predict. Changing nail polishes to one that doesn’t affect the nail is a quick and easy fix. Lighter nail polishes are less likely to stain, and wearing a base coat avoids any chemicals in the nail polish coming into direct contact with the nail itself. What Are the Interior Causes? The texture and coloration of the nails change considerably during pregnancy. This is due to the extra hormones that are being produced. The nails are more likely to split and break. These changes are more circumstantial than they are dangerous. In most cases, they will go away after pregnancy. If yellowed nails do occur, you should avoid aggravating the problem with nail polish or other irritants. The feet can also swell due to the extra fluid in the body. To avoid more damage to the nail, it is advisable to wear a better-fitting shoe should this happen. Some people with diabetes will notice their nails taking on a yellowish hue. Often, this coloring is a product of the breakdown of sugar effecting collagen in the nail. In this case, the coloring isn’t necessarily an indicator of anything worse to come. It may not need to be treated at all. In some cases, it may be a sign of a fungal infection. Onychomycosis is about twice as common in people with diabetes. Reduced blood circulation and diabetic nerve damage in the feet can prevent a person from noticing the signs at first. For example, a diabetic may not notice a cut on their foot or toe as quickly, which can lead to infection. Foot care is more critical than usual if you have diabetes. Checking your feet often for sores and cuts will help prevent toenail problems before they become serious. Yellow Toenail Syndrome is a rare condition, with only about 150 cases described in medical literature. The nails become thick, yellow, and marked with an increased side-to-side curvature. The nails grow slowly, at a rate of 0.35 mm a week, or less. Other effects include a reduction in the size of the white crescent at the base of the nail and a detachment of the nail from the nailbed. Most people with Yellow Toenail Syndrome (about four-fifths) will also suffer from lymphedema. Lymphedema is a condition of localized fluid that causes tissue to swell. This is a result of damage to the lymphatic (or secondary) blood vessels, which affects circulation to the feet. Additionally, sufferers of Yellow Nail Syndrome may experience respiratory problems. About half of all sufferers have either recurring chest infections or a chronic lung condition known as bronchiectasis. Nails are affected by the quality of circulation to the feet. If you have bad circulation, your feet will be one of the first indicators of this issue. Yellow toenails, while by no means exclusively an indication of poor circulation, are one of the most visible effects of it. Bad circulation can be the result of a pre-existing medical condition. Type 2 diabetes, obesity, or a lack of exercise can all affect good circulation. However, it can also be caused by a sedentary lifestyle, regardless of whether you suffer from weight problems. Poor circulation can also affect your feet in the form of cramps, a weakened pulse, discolored skin, and slowed toenail growth. Yellowed toenails caused by poor circulation can signify other underlying health conditions. Be aware of what may be causing it. One chronic cause of yellow-colored toenails is age. Toenails can slow in growth from as early as 25 by about 0.5% per year. This may not seem so significant, and may even be beneficial to those who do not trim their nails frequently. However, the older you become, the slower your nails will grow, and the thicker they will become as a result. With age, your nails can turn yellow in color, or even slightly opaque. As with other signs of yellowing, if the process is rapid, then the cause may lie elsewhere. Identifying if the color is a product of age or illness is essential when it comes to treating it. Hypothyroidism, also known as low thyroid, is a disorder in which the thyroid gland does not produce enough thyroid hormone. The thyroid hormone is responsible for regulating your metabolism. They are essential for regulating the growth of all cells in the body, including onychocytes, the nail cell. Hypothyroidism can display many symptoms. These can include depression, weight gain, constipation, as well as yellowing nails. Hypothyroidism shouldn’t be a concern for most people, as it is most commonly the result of an iodine deficiency. However, changes to the toenails could be a sign of this disorder. The absence of the lunula (the white half-moons at the base of the nail) and a separation of the nail from the nail bed are two notable symptoms. Heart disease is an umbrella term for a wide variety of conditions involving the heart. Hypertensive Heart Disease, Congenital Heart Disease, and Rheumatic Heart Disease are just a few examples. Around 1 in 4 deaths in the United States are due to heart disease. Age, tobacco, excessive alcohol consumption, physical inactivity, and genetic dispositions can all play a role in contracting these various diseases. One universal effect of heart disease is the restriction of blood vessels. In which part of the body blood vessels are affected can vary and can have potentially life-threatening consequences. One condition, Peripheral Arterial Disease (PAD), involves the build-up of fatty deposits in the arteries that restricts the blood supply to leg muscles. Many people will suffer no symptoms, but some will experience sharp intermittent pain in their legs when they walk. Other symptoms can include brittle, discolored, slow-growing toenails. The symptoms can develop slowly, so it may not be immediately apparent that they indicate PAD. Toe infections are comparatively common, especially for those with a weak immune system. Knowing the cause of the infection can help determine the severity of it. Your toe is more likely to be infected in certain circumstances. These include cutting the nail too short, having an ingrown toenail, or having calluses on the toe. If the toe exhibits signs of redness, pus-filled blisters, or cracked thickened yellow toenails, it may be infected. Diagnosis and treatment should be a priority. Accidental injuries to toes are common. They can be caught in doors, crushed, stubbed, cut, and bruised. Though these injuries are painful, they are not usually severe. The nail serves to protect the toe from egregious injury in these scenarios. They will take the brunt of the damage in most cases, and their appearance will reflect this. However, a severe injury to the nail may result in its loss altogether. If a nail is damaged enough, it will die, and begin to turn yellow as it decays. Alternatively, if the nail is particularly bruised, the color may also change to yellow. It can become black, brown, or purple, depending on the damage caused to the toe below the nail. If you smoke, you may notice your toenails turning yellow. This is due to the effect cigarette smoke has on the nails. Nicotine and tar stain fingernails as the smoker hold their cigarette. You also run the risk of staining the skin around the nails. Smoking blocks oxygen supplies to the toes by constricting capillaries and blood vessels. The less oxygen that reaches the toe, the yellower the nail will become. A reduction in oxygen also increases the chances of an infection. Without the proper amount of oxygen and nutrients, your natural defenses are lowered. This can lead to a host of problems in of itself, including fungal infections. Do I have fungus or a different medical condition (trauma, yellowing caused by polish, yellow nail syndrome, lymphedema, diabetes, etc.)? Do I have mild, moderate, or severe toenail fungus? How long is it likely to take for the condition to clear up? Is there anything that I can do to promote faster healing? How can I avoid infecting my family and friends? Can I continue with my day-to-day activities, such as going to the gym? Do you recommend an over-the-counter product? What are the side effects associated with prescription medications? How do I avoid getting infected in the future? Don’t delay treatment for a nail fungus because it can spread to other toenails. If you’ve only got mild fungus, the Purely Northwest toenail fungus system can get rid of toenail fungus in 1 to 3 months. The sooner that you take action, the easier that it’ll be to address. Give a product enough time to work as there’s no instant ‘fix’ for nail fungus.